IronRisk Strategies, LLC combines the knowledge and expertise obtained through over 26 years of experience in Risk Management and Insurance, with the lessons learned from 12+ years of racing in over 30 triathlons and 5 Ironman Triathlons. We have developed a systematic process to help our clients effectively manage risk, decrease cost and increase profitability. All businesses are faced with Risk each and every day. Effectively managed businesses take the time to identify those Risks and develop plans to minimize the impact of those Risks. 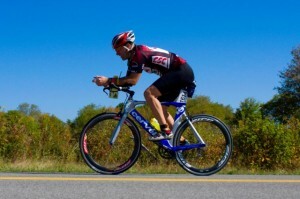 Training for and racing in long distance triathlon is a powerful metaphor for Risk Management. The Ironman distance triathlon is considered to be the longest single day event created by man. It is comprised of a 2.4 mile swim, a 112 mile bike ride and a marathon (26.2 mile run.) All three disciplines must be completed within 17 hours or less. Whether you are competing in the Ironman World Championship in Kona, Hawaii or one of the other “Iron Distance” races throughout the world, proper planning and implementation is a must. That process parallels that of effective Risk Management. In fact, all athletes are managing risk from the day they register for an Ironman triathlon, to the moment they cross the finish line. We will help your business identify your unique risks, develop a plan to effectively manage those risks, implement that plan and monitor whether or not that plan is working.